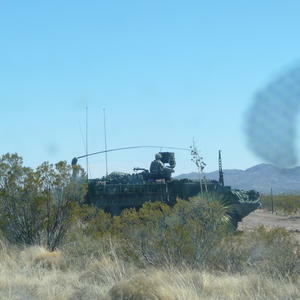 On February 26, I was driving with a friend in an isolated region of the U.S.-Mexico border in New Mexico when we saw a military tank positioned to be looking south. A lot has been said, written, and documented about the degree and ongoing process of border militarization, but I had never seen anything like this. We were on route 9, just past Playas but not quite to the border town Columbus. The combat vehicle was such a surprise that I hit the brakes, did a three-point turn, and drove back to make sure that we weren't seeing things. While turning, a soldier came up through the top of the tank with a desert camouflage helmet and looked our way. We waved at him awkwardly, and he waved back. He then leaned forward into the surveillance equipment outfitted for the tank. In front of him was the vast highland desert of southern New Mexico. We were about 20 miles away from the physical border line. Any blurriness in the pictures is probably due to the fact that we had to take the photos in motion, without stopping. This (photo to the right) was the first of three such combat vehicles that we saw. The second one was stationed on a hill a little to the south of route 9. 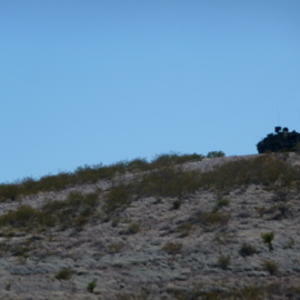 Approximately 200 yards behind the tank on another hill was a Border Patrol Vehicle. They were lined up together, leading us to believe that they were doing surveillance together. 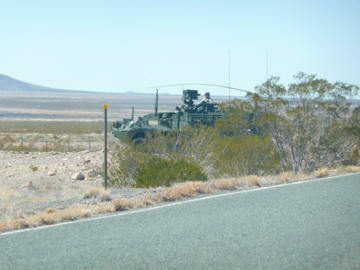 Still a third tank was in the Border Patrol’s Forward Operating Base closer to Columbus. It was inactive, parked among the green-striped vehicles in the lot. Turns out that these weren’t any old tanks. They were Strykers, made by General Dynamics, a military contractor and manufacturer that is turning more of its attention to the U.S.-Mexico border and Homeland Security endeavors. Strykers are the latest and most modern of U.S. tank technology, used extensively in Iraq and Afghanistan, and deemed the 'Cadillac of combat vehicles," by Defense Technology International senior editor Paul McLeary. These tanks are slick and fast, able to reach speeds up to 60 mph. Packed with surveillance technology and a state-of-the art communication system, and designed to be able to handle combat in all scenarios (see video below), they are an all-seeing and hearing armored beast. DHS Officials have not made any public mention about these tanks, nor given any clear indication to why they were patrolling the borderlands. The best guess is that the Strykers are part of Operation Nimbus II, an operation between Customs and Border Protection (CBP) and the Department of Defense (DoD) announced on February 22. In this operation 500 soldiers from Fort Bliss (there is a Stryker brigade at Fort Bliss) and Fort Hood, Texas will be supporting Border Patrol with “intelligence and surveillance” assistance for two months. CBP prohibits the soldiers from making direct arrests, which would probably seem hard to believe for a migrant encountering that armored vehicle on her journey north. In January, Several dozen soldiers parachuted onto Fort Huachuca from the Alaskan airborne engineer brigade. After that dramatic entrance into the Arizona borderlands, they set to work on building a road 3 miles west of the Mariposa port of entry in Nogales. According to an article by Jonathan Clark in Nogales International, program organizers say this “mirrors the type of mission the 40 soldiers might conduct if they were deployed to a place like Afghanistan." This raises some significant questions: Are the U.S.-Mexico borderlands being used as training ground for overseas wars? Or are those overseas wars starting to become more present in the borderlands? Or both? So, yes, both. Raising still another question: Will this now be standard practice?